This dress is SO perfect! Beautiful embroidered Peasant-style tunic dress direct from FEVRIE. This is the mini or half tunic dress which comes above the knee and can be worn as a dress or as an over sized blouse. And also this dress is a maternity staple (leaves plenty of room for growing belly) and it has also become synonymous with summer. It also can be worn as a tunic with jeans or leggings or could be belted even. And it’s actually great with boots or high heels and can be worn for a night out or as a beach cover, very versatile. Dress it up or dress it down– it all works .This piece is 100% rayon, meant to be loose fitting and cool for summer. I am absolutely thrilled with this dress. The color is gorgeous and the embroidery is outstanding. I plan to collect more dresses this summer and encourage anyone looking for a Tunic peasant dress to buy one from this site. Head over to (FEVRIE.COM) and you can also follow them on Instagram at @fevriefashion. For a limited time you can get an awesome discount using my code LENPARENT at checkout to get 25% off your order. The code is valid until 8/15/15. Happy Shopping! How gorgeous are you my BFF! That’s the perfect exploring your city dress! Love the turquoise and silver together and that bag is great! What a gorgeous blue tunic dress! I’m loving the price also! Thanks for the review tip and discount code. How awesome is this opportunity! I’m obsessed with this post! you always have the best printed dresses. Plus I’ve been on the fence about the Celine Python bag, but I love the color you have and the way you wear it. I think I definitely have to save money for this one! Stay gorgs! WOW!!!! Greeting from CALIFORNIA!!! What a pretty pretty dress! Perfect for a weekend stroll, shopping or brunch with the girlfriends. I love the embroidery and that it has a voice of it’s own. Wise choice with keeping everything else understand and neutral. Loovin your style and your fabulous blog! 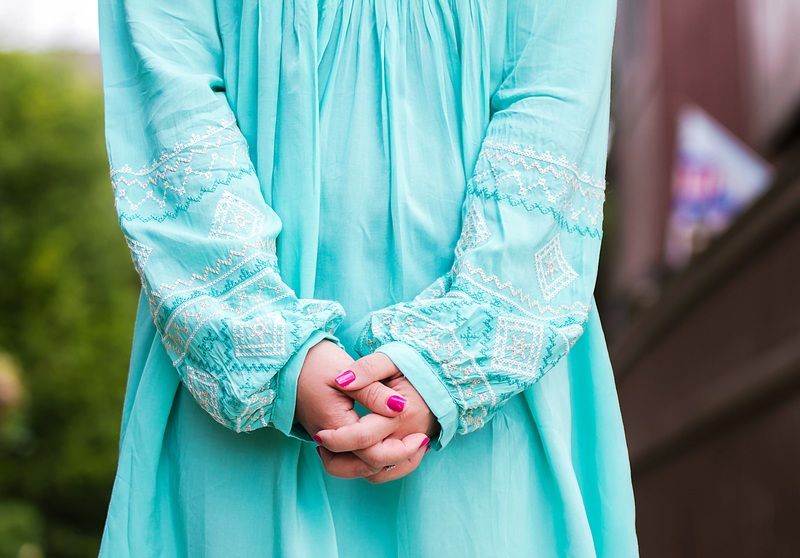 This blue tunic dress is the perfect summer piece! i love the print and the shape. ideal for a weekend brunch! You look breath taking , i can’t get enough of your shoes . Lovely pictures , and have a fab weekend! You are so gorgeous. This dress is so pretty. I love the embroider and color of this dress. Love the dress <3 ! I agree that this dress is utterly perfect! It looks stunning on you, and I love the colour! eu amei esse post, me apaixonei pelo vestido. Lovely dress! I can see how versatile it is! Wonderful and beautiful, coloured outfit! LOve this look!! That dress is super cute and those shoes are just amazing!! So pretty!! Hope you had a great weekend!! Que look maravilhoso, tenha uma semana abençoada. You are so elegant! The color of that dress, those shoes, the Celine bag! My eyes are quite literally popping out of my head. Love this look! Eek! What a beautiful tunic dress! I love how vibrant the colour is on you and the embroidered detail is amazing. You look stunning? Blue is so your colour babe I love it. 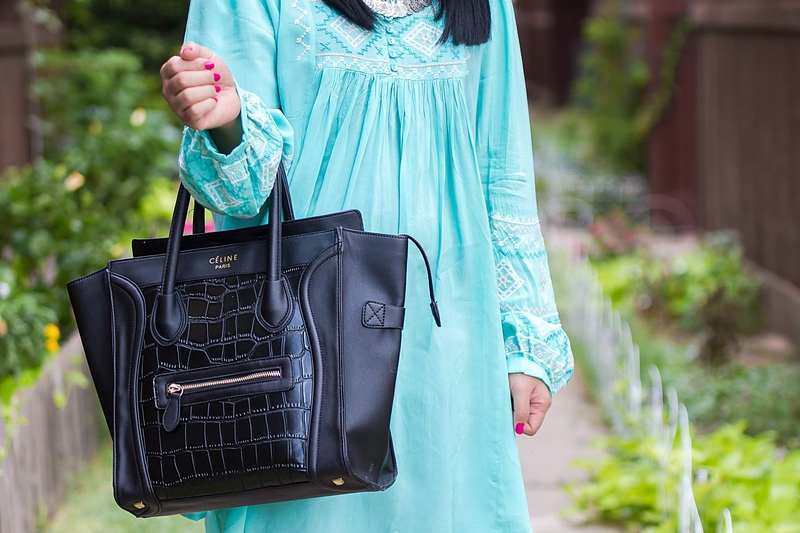 I adore that tunic dress! The embroidery is divine and that color is perfect for summer! Love the stunning shoes, too! love the mint dress and awww! those cuffs are stunners! I have to show some thanks to the writer for rescuing me from such a difficulty. After checking throughout the the web and finding notions that were not pleasant, I thought my entire life was over. Living devoid of the approaches to the issues you’ve sorted out by means of your good write-up is a crucial case, and the kind that could have in a negative way affected my entire career if I hadn’t noticed your blog post. Your personal know-how and kindness in controlling every part was useful. I am not sure what I would’ve done if I had not encountered such a solution like this. I can at this moment look ahead to my future. Thanks so much for this expert and effective guide. I will not be reluctant to recommend your web blog to anyone who requires recommendations about this topic. I wish to convey my respect for your generosity giving support to folks who require guidance on this one issue. Your real commitment to getting the solution all around became certainly productive and have continuously permitted women just like me to realize their targets. The invaluable report signifies this much a person like me and extremely more to my peers. Thanks a ton; from all of us. Needed to send you this bit of note so as to thank you once again for your amazing suggestions you have discussed on this page. This is quite shockingly open-handed of people like you to provide easily what exactly a few individuals could possibly have made available for an ebook to make some money on their own, chiefly considering the fact that you might have done it in the event you decided. Those concepts also served as the great way to understand that someone else have the identical interest like my personal own to see many more in respect of this condition. I think there are several more enjoyable periods up front for many who scan through your site. I wanted to draft you that tiny observation to finally thank you over again with the amazing secrets you have contributed here. It has been certainly extremely generous of people like you to allow unreservedly precisely what many people would have advertised for an e book to help make some cash for their own end, particularly since you might well have done it if you ever wanted. The good ideas likewise worked to become easy way to be aware that other people have a similar desire the same as my very own to find out lots more with regards to this matter. I believe there are several more pleasurable instances in the future for individuals who check out your website. Thank you a lot for giving everyone an extremely nice opportunity to read from here. It is always very brilliant and as well , jam-packed with amusement for me and my office mates to visit your web site at a minimum 3 times in 7 days to find out the new stuff you have. And indeed, I’m just always satisfied concerning the perfect solutions served by you. Selected 1 facts in this article are surely the very best we have had. That is the fitting blog for anybody who wants to find out about this topic. You understand so much its virtually laborious to argue with you (not that I actually would want匟aHa). You undoubtedly put a brand new spin on a topic thats been written about for years. Nice stuff, simply nice! I really wanted to construct a simple remark to say thanks to you for all the stunning tips and tricks you are placing on this site. My time consuming internet research has finally been compensated with really good ideas to go over with my two friends. I ‘d admit that most of us website visitors actually are unequivocally blessed to exist in a wonderful website with very many outstanding individuals with good tips and hints. I feel quite grateful to have discovered your web page and look forward to many more fabulous moments reading here. Thanks a lot once more for everything. Thanks so much for giving everyone an extraordinarily nice opportunity to check tips from this site. It is usually so ideal and as well , packed with amusement for me personally and my office friends to search your site at the least three times in 7 days to learn the new guidance you have got. And indeed, I’m at all times fascinated with your tremendous advice you serve. Some 2 areas in this post are completely the most suitable I’ve ever had. I enjoy you because of all of the labor on this site. Gloria really loves doing research and it’s really simple to grasp why. Most of us learn all concerning the powerful way you provide precious secrets on your web site and welcome response from some other people on this concept then our princess is without a doubt starting to learn a lot. Take pleasure in the rest of the new year. You are performing a glorious job. I simply desired to appreciate you once again. I do not know what I could possibly have handled in the absence of the entire smart ideas revealed by you about that situation. It was an absolute depressing situation for me, nevertheless being able to view a new skilled strategy you treated that took me to weep for delight. I am just thankful for this service and as well , believe you comprehend what a powerful job you are always carrying out teaching others using your blog post. I am sure you’ve never met any of us. Thank you a lot for providing individuals with an extraordinarily memorable chance to check tips from here. It is often so pleasant plus packed with a great time for me personally and my office colleagues to visit your web site at the least thrice in 7 days to read the latest issues you will have. Not to mention, I’m also at all times satisfied with the amazing guidelines you serve. Certain 3 ideas in this post are indeed the most impressive we have all ever had. of a user in his/her brain that how a user can know it. Therefore that’s why this paragraph is outstdanding. might never understand. It seems too complicated and very huge for me. I am regular visitor, how are you everybody? This paragraph posted at this site is actually nice.